Hi, I’m Kimberley and I am a fully qualified (BSc) Sports Therapist graduating from Coventry University; with a 1st class honours degree. 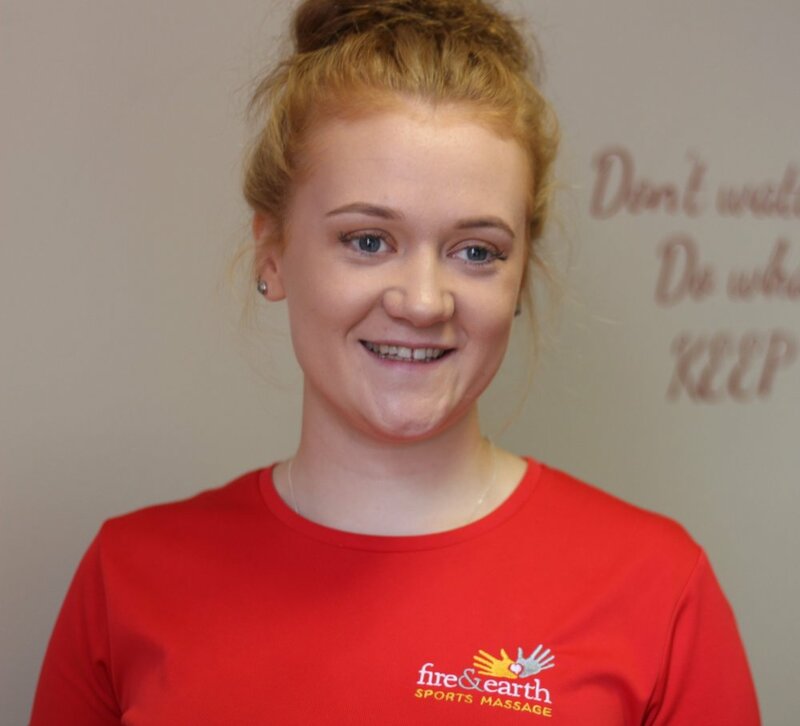 It is great to be on board with the Fire & Earth team, which is already enabling me to grow as a therapist; gaining valuable knowledge and experience. My passion lies in the delivery of manual therapy and soft tissue treatments to help you feel better and be able to get back to the sports you love. I have experience as a Sports Therapist with Earlsdon Rugby Club, where alongside my final year of university I completed a year long placement, being appointed the position as 2nd team Sports Therapist now that I am fully qualified. I have also provided massage at the Coventry half marathon, as well as providing first aid cover at the Ricoh Arena for the U16’s school football final. These experiences have allowed me to communicate with and provide treatment for a variety of individuals. From a very young age, I had a keen passion for Netball. Starting as a player for a local youth league in my home town in Suffolk, progressing to a ladies league as I grew older and more skilled, to being selected for county netball trials as part of the England Netball Pathway - of which I was successful. However, after suffering injuries which sometimes prevented me from playing and often resulting in negative effects on my performance, I didn't manage to progress past the regional team. It was during this time that my appreciation for health professionals within fitness and well-being industry grew, as I required constant injury management and maintenance. I also understood the need for continuous treatment, rather than every once in a while in order to see improvements. My aim as a Sports Therapist is to enable clients, where possible, to continue doing what they love without the worry of being hindered by a niggle or injury. In the future I aim to study towards a masters degree in sports medicine or physiotherapy. I am currently working out of Simply Gym, Cannon Park on Mondays, Thursdays, Fridays and Saturday mornings. I'd love to meet you all and fix those niggles or just give you some advice so please feel free to contact me via email or simply book in and say hi!